This is f. 2v (i.e. the back side (verso) of the second sheet (folio) of the manuscript) of the Lindisfarne Gospels, by far the most famous and probably the most stunningly illuminated of the Anglo-Saxon manuscripts. It was made in the late 7th or early 8th centuries at Lindisfarne, a monastery in the north of England that was founded by Irish missionaries, and held control over a vast network of smaller monasteries in the region. Carpet pages like this one are characterized by geometric and colourful designs that take up an entire page, as here. They are mainly an Irish tradition, and can show an Irish artistic influence, as here. Notice the similarity to the Lindisfarne carpet page. This suggests that the stones may have been designed by the same artists as were responsible for illustrating manuscripts – they were used to creating certain kinds of designs, and transferred these designs to stone. 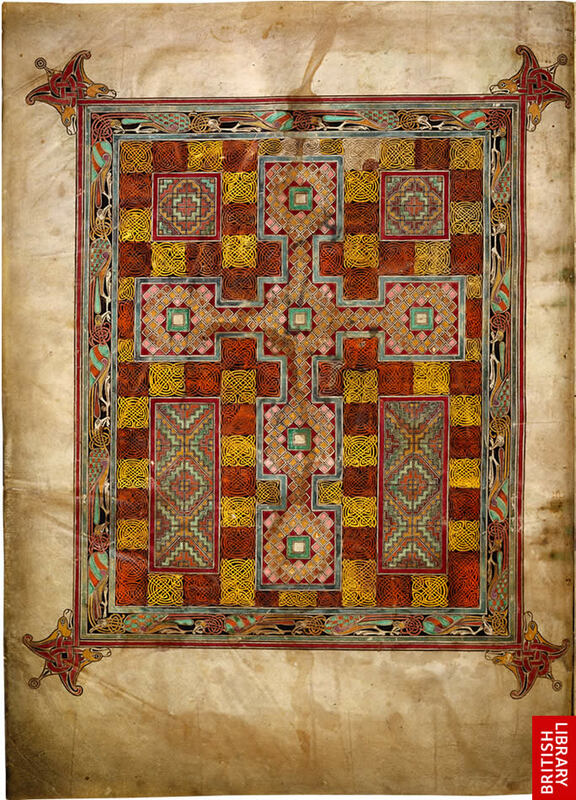 This entry was posted in Anglo-Saxon/Old English, Art, On Display and tagged art, carpet pages, design, illumination, irish influence, knots, lindisfarne, manuscripts, tombstone. Bookmark the permalink. Is that ‘quicumquae [hypercorrect] hunc titulum legerit orat pro berechtuine’? It’s interesting that it’s in the third person – if I remember aright (which I may not) Roman ones are often directly addressed to the reader. 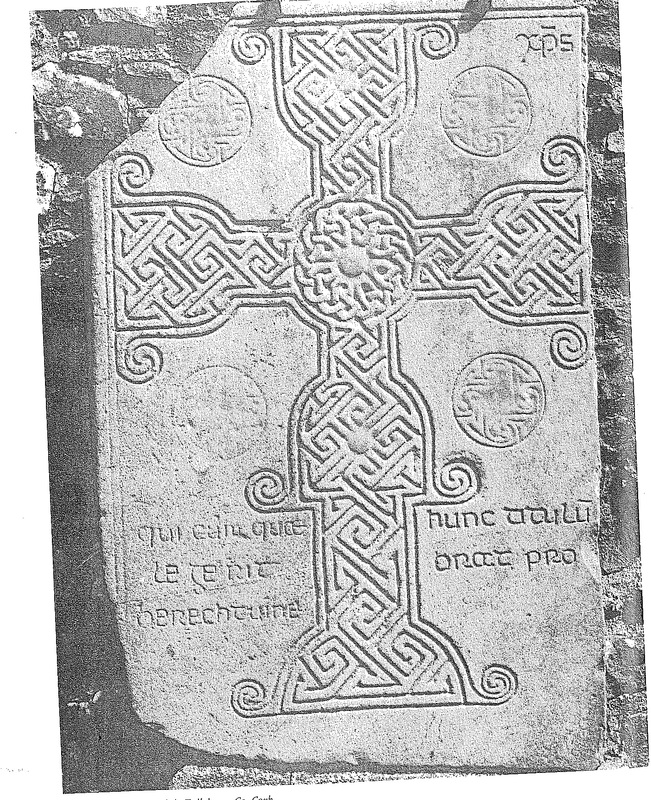 As far as I know both second and third person appears on Anglo-Saxon and Irish grave stones. Roman stones were also not necessarily addressed to the reader. Some, like this one (http://www.fitzmuseum.cam.ac.uk/opac/search/cataloguedetail.html?&priref=65533&_function_=xslt&_limit_=10#1) are descriptive, in the “X set this stone up for Y” formula. The Roman analogue also only goes so far – Roman and Anglo-Saxon grave stones could serve very different functions; the Roman ones seem to be more directly memorial, the Anglo-Saxon often being calls for prayer. Also recte ‘oret’, no? Or is ‘oro’ sometimes construed as third in Ireland? Though perhaps I am becoming bogged down in trivialities. I don’t really know the finer points of Hiberno-Latin, but i’m assuming it’s just a mistake. The quality of the latin on inscriptions obviously varied quite a bit, and the sense is perfectly clear, anyway.